This 2019 PR70 Silver Eagle Dollar Coin is the highest grade possible. 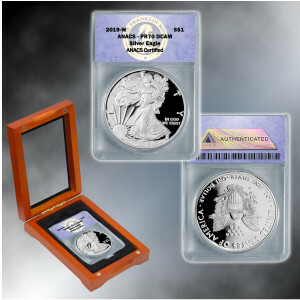 Silver Eagle coin - genuine legal tender silver bullion coin struck by the United States Mint. It has been made each year since 1986 in a limited edition and is now one of the world's most popular silver bullion coins. Struck at least twice on highly polished coin blanks to bring out the mirrored background and high-relief images Great imagery - features Adolph Weinman's Walking Liberty on the face and a heraldic eagle with symbolism representing the original 13 colonies on back Graded PR70 - in Proof condition with the highest possible grading of 70, this coin has outstanding eye appeal and retains its full original luster. 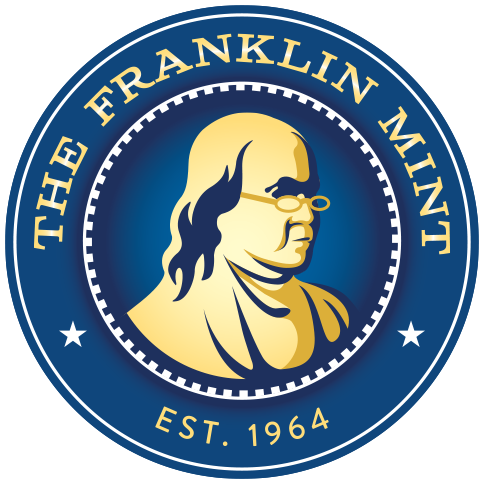 Graded and certified by an independent coin grading company. Encapsulated in clear acrylic - comes in a sonically sealed, tamper-resistant acrylic holder. Dimensions: 7.5" x 4.6" x 2.3"
Comes in a wooden display box.